Can voters trust either the disappointing President Buhari or widely-accused challenger Atiku to tackle corruption if elected? In 2015, Muhammadu Buhari swept to power at the ballot box promising to tackle corruption. His reputation for integrity contrasted sharply with that of Nigeria's then ruling People's Democratic Party (PDP) and he was elected on a wave of optimism. Four years later, he can point to some accomplishments on this front. Under his tenure, the Economic and Financial Crimes Commission (EFCC) has secured hundreds of convictions, including those of two former governors. Meanwhile, the government claims to have recovered billions in embezzled funds, including $2.9 billion between May 2015 and October 2017. Buhari's administration has also made some progress on policy. It has established the Presidential Advisory Committee against Corruption (PACACC). It introduced a whistleblower policy which grants individuals 2.5-5% of any funds recovered thanks to their tip-off. And it fully implemented the Treasury Single Account (TSA), intended to simplify government payments and reduce opportunities for graft. However, Buhari's war on corruption has not all been plain sailing. Most analysts agree that investigations have targeted political opponents. There has been a lack of coordination between key actors such as the EFCC, the police, and the Department of State Security (DSS). And the crusade has largely been targeted at the political centre in Nigeria, meaning there has been relatively little impact at the state and local government levels. For some pundits, Buhari has tackled the impunity of certain figures, but not addressed the broader structural problems of corruption. On 16 February 2019, Nigerians return to the polls to vote for their president. And once again, corruption will be a key campaign issue. 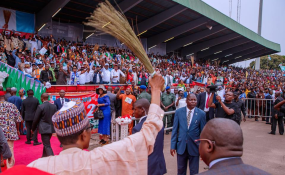 The presidential race looks set to be a two-horse race between President Buhari of the ruling All Progressives Congress (APC) and the main opposition PDP's Atiku Abubakar. In terms of corruption, this match-up arguably plays into the incumbent's hands. While Buhari is still largely regarded as an austere figure, former vice-president Atiku faced numerous high-profile allegations of corruption during his eight years in office from 1999 to 2007. For instance, Atiku is linked to the trial of US Congressman William Jefferson, who allegedly tried to bribe the then vice-present on behalf of a tech company. The US politician was convicted in 2009 and sentenced to prison. When Atiku was selected to be the PDP's flagbearer, the APC understandably highlighted this past. The party challenged Atiku to visit the US from which he was rumoured to be banned due to the Jefferson case. It also reminded voters of how former President Olusegun Obasanjo had heavily and vocally criticised his former deputy since the two fell out in 2006. Even as recently as August 2018, the former president had said: "If I support Atiku for anything, God will not forgive me." Atiku met both these challenges in part. He paid a visit the US, though Reuters reported that he was only to thanks to a temporary suspension of his travel ban. And in a dramatic twist, Obasanjo forgave and then endorsed Atiku, saying the PDP candidate he would be "two times better" than Buhari. Nonetheless, the former vice-president has been hit with new apparently politically-motivated accusations around his alleged role in the collapse of the bank PHB. President Buhari is still regarded as incorruptible by many of his most ardent supporters. However, the ruling APC's attempts to mobilise around anti-corruption have not been wholly effective. This is partly because of allegations swirling around top members of the APC itself. The ruling party contains several individuals who have faced accusations, while it has accumulated more through defections from the opposition. Former PDP chair Adamu Muazu, for example, faces widespread allegations of corruption. At one point, Buhari was even alleged to have signed a legal aid treaty with the UAE primarily as a way to extradite Muazu back from his exile in Dubai to face justice in Nigeria. Yet this January, Muazu sneaked back into country to be welcomed into the arms of the APC. The APC also recently greeted two-term former Akwa Ibom governor Godswill Akpabio into its ranks. The political gladiator was being investigated by the EFCC over the reported theft of N100 billion ($2.77 million) from state coffers between 2007 and 2015. The ruling APC also contains others such as former chair of the Presidential Task Team on Pension Reforms, Abdulrasheed Maina, who was accused of running a fraud scheme worth about N100 billion ($2.77 million). He was fired from the civil service in 2013, deemed wanted by the EFCC, and absconded from Nigeria. He reappeared in 2017 with a position in Buhari's Ministry of Interior. Following a public outcry, he was removed but there is no news of his prosecution till date. In a speech this January, APC party chairman Adams Oshiomole even said publicly: "join APC and all your sins shall be forgiven". After sixteen years of impunity under the PDP, the APC promised a new era. What they have delivered, however, is continuity with their predecessors' general approach. It was President Obasanjo who created the EFCC and Independent Corrupt Practices Commission (ICPC). And it was President Goodluck Jonathan who introduced the Treasury Single Account (TSA) and worked to establish an Integrated Payroll and Personnel Information system (IPPIS). Though a new party is in power, Buhari has built on these reforms, implementing the TSA and strengthening the capacity and mandate of the EFCC. To most Nigerians, though, levels of corruption remain largely unchanged. A more strategic engagement is needed, one that doesn't just tackle the impunity of individuals but includes structural reforms. That means decentralising anti-corruption initiatives to state and local levels; targeting individuals and sectors with the aim of changing internal practices; reviewing appointment procedures of anti-graft agencies; and creating space for citizens, journalists and civil society to ask questions. Based on their records, it is doubtful if either main candidate can deliver this.